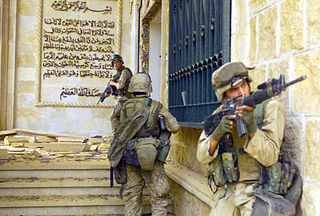 The United States invaded Iraq in alliance with Britain on March 20, 2003. The US has occupied and dominated the country, with a large military force and many bases. GPF has a comprehensive report entitled "War and Occupation in Iraq" . We have organized this site into three broad thematic areas: Political Issues, Humanitarian Issues and Historical Issues, as well as Links and Resources. Of particular interest today are the sections on Withdrawal of US Forces and on January 2010 Elections. Soon after the invasion, occupation forces encountered an armed Iraqi resistance. In response, the occupiers carried out intense counter-insurgency operations, using Siege Tactics and Attacks on Cities, a major air war, and punitive measures that led to Atrocities and the routine killing of civilians. US-UK Justifications for the War, including the charge that Iraq possessed nuclear weapons, soon proved false. The occupiers set up detention centers and prison camps where they have held thousands of Iraqis indefinitely without charge or trial. Torture and Abuse have been common, especially in secret prisons. Occupation programs for Reconstruction of the war-damaged country led to massive corruption, fraud and malfeasance. Evidence suggests that the US and UK sought to gain control of Oil in Iraq and to dominate the larger oil-rich Gulf region. Nearly a century earlier, oil was the dominant geo-strategic goal of British colonial policy in Iraq. The site's extensive Historical materials provide evidence on oil, as well as other key issues. Investigations into Mortality have estimated very large number of Iraqi deaths since the invasion in 2003. More than four million Iraqis have also been displaced and refugees, one aspect of the broad Humanitarian Crisis.This site examines the United Nations Role in the Iraq conflict, including the long period of Sanctions from 1990 to 2003, the debate about the war resolution, and the UN role after 2003. Other issues include the US Permanent Bases, the damage inflicted by the conflict on Iraq's Cultural Heritage, and the use of Indiscriminate Weapons by the occupation forces. There are also considerable materials on Iraq's Government and Political Process. Other resources on the site include major Documents, analysis of International Law Aspects of the conflict, materials about the "Coalition" that joined the US-UK operation, and the dozens of Public Opinion Polls that have shown how Iraqis oppose the occupation and want it to end.